The Marvin’s Building Materials Customer Survey, found at Survey.Marvinsbuildingmaterials.com, is an online questionnaire designed by Marvin’s Building Materials that can help the company rate customer satisfaction. Information from the survey is used to make necessary changes. This survey is done online for your convenience. Telling the company your thoughts is important for you both. The company can learn what happens in their stores and make changes when they are necessary. This can provide you a better experience, making it important to be honest. Remember, they receive many surveys each day. Each person tells their own story, but there may be cross points that match. If everyone has a poor experience or has a bad greeting, they know they need to change that. You can also win $500 cash by entering a sweepstakes. Based in Alabama, Marvin’s is a hardware store that offers quality hardware goods along with excellent complementary services. Marvin’s Building Materials caters to almost every product or service requirement there is to a house – be it plumbing, electrical works, housewares, etc. Unlike other hardware companies, Marvin’s places a lot of importance on customer service. This not just means providing utmost importance to buyers but also ensuring employees have the space and freedom to move around and work as if they owned the business. Every employee is empowered and trained enough to handle customer grievances and queries by themselves, not expecting the top management to chime in at all times. This eventually ends up benefiting the customer in the form of seamless and quick service. 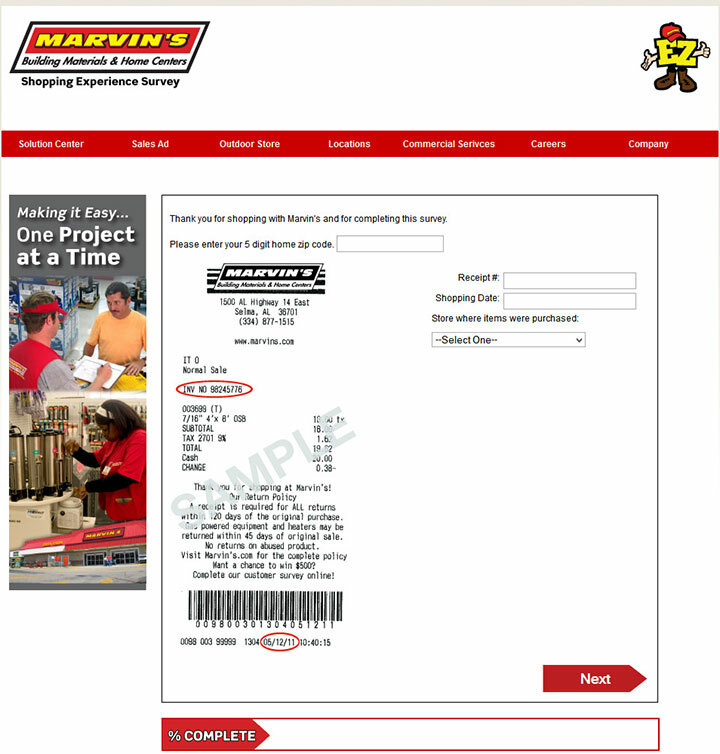 Have your recent Marvin’s Building Materials receipt that contains an invitation for the survey. Enter your zip code where you reside, which should be five digits. Also enter the receipt number, date you shopped and the store where the items were purchased. The receipt number may also be called the Inv No. Answer questions. Rate how satisfied you were with different things, including price, variety and quality of products. You will also rate the organization of the store, their stock and much more. Answer whether you knew they had free delivery or not. Text boxes may be provided; please use these to provide more information. Enter the sweepstakes. You must click the check box that says you want to be entered. Then fill out the short form, agree to the terms and conditions and click Finish.